Ben & Jerry's has been serving up free food days since 1979. Tuesday, March 23, is Free Cone Day. (CNN) -- For many Americans, nothing beats the flavor of free -- and national chains are taking note. Tuesday, Starbucks is offering a free pastry with the purchase of any brewed or iced coffee until 10:30 a.m.. 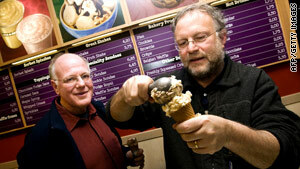 The same day, Ben & Jerry's is celebrating Free Cone Day -- a tradition of the ice cream shop since 1979. In challenging economic times, companies are increasingly turning to giveaways like these to bring new customers to the stores. In February, lines snaked outside and around Denny's restaurants nationwide for a free Grand Slam breakfast advertised during the Super Bowl. KFC's 2009 Oprah-backed grilled chicken giveaway led to overwhelmed franchises and some empty-handed customers. And National Pancake Day at IHOP was the largest one-day event in the 51-year history of the company. Marketers hope that if customers like what they eat, they'll come back. But when freebie days aren't on the horizon (Dunkin' Donuts' annual free iced coffee day has yet to be rescheduled), here are some resourceful ways -- both practical and extreme -- to score some nosh for nothing. This freebie will certainly deliver the most caloric bang for your non-buck, and comes with a great big side of bragging rights. Beware though -- usually if you can't finish the restaurant's signature 40-ounce chiliburger belly-buster or gallon-sized oyster bucket in the allotted amount of time, the meal won't be quite so gratis -- and neither will the antacid. As the old saying (sort of) goes, "One man's trash is another man's afternoon snack." With a little luck and dumpster savvy, you can find food still in its original packaging in the refuse of major grocery stores. Bakeries are also another popular destination for "freegans" -- practicioners of a lifestyle that embraces anti-consumerism -- as bagels, donuts and loaves of bread not sold that day are thrown out. If you're willing to risk a little reek, broken glass and a chance of botulism, dive in. Baby-sit around meal time. As parents head out for date night, they'll give you free rein over their pantry or offer up pizza money. No one wants a hungry, cranky toddler on their hands. Make like Vince Vaughn and Owen Wilson and make yourself an unexpected plus-one at a wedding; phenomenal finger food and oftentimes an open bar await. Come prepared with a story about how you know the bride or groom and stay away from sit-down dinners, as a seating chart is a surefire way to blow your cover. To the delight of starving artists and students, light hors d'oeuvres and beverages are regularly served up to art-lovers as they ponder newly unveiled sculptures, paintings, photographs and exhibitions. Nibble some hummus as you get chock full of culture. If you're willing to risk the embarrassment of tone-deaf employees droning the traditional song, many restaurants will spot at least one free, candle-adorned dessert in celebration of your very merry unbirthday. If you've ever been grocery shopping on a weekend afternoon, you know the free samples are aplenty. With a little planning, it's possible to make a small meal just by strategically navigating the aisles. Just check your sense of shame in the parking lot. Many pubs offer free grub during happy hour. Pile your plate high with chicken wings, loaded potato skins and beer nuts all for the price of a single brewski. Free food -- are people really that hungry or do they just like free stuff? Tell us in the comments!